With the warmer weather, people and their pets like to spend as much time together enjoying the great outdoors. However, with the hotter weather comes a lot of biting and stinging insects which dogs often like to chase. Most dogs are curious creatures and some dogs love to chase bees or some enjoy rummaging around in the long grass making the chance of them getting stung pretty high. The result of a sting could be a soft swelling on their face or muzzle but dogs can get stung on their paws too when they step on an insect. If you dog is limping or looking a bit sorry for themselves check their paws for stingers. Your pet will feel a little discomfort but an insect sting is not a terribly serious problem for a majority of dogs. Some dogs may have an allergic reaction or if they get stung on more sensitive areas like their mouth or muzzle then it can turn into a bigger problem. If your dog has been stung by a bee keep a close eye on him and watch out for any signs of swelling, especially if this is around the neck or face. Some dogs may break out in bumps (hives) all over their body. More severe signs to watch for are: severe hives all over the body, difficulty in breathing, sudden diarrhoea or vomiting, drooling, weakness or pale gums. If your dog suffers any of the above it is essential you get them to the vet immediately. If you can still see a barbed bee sting in your dogs’ skin, you can try to carefully remove it by dragging a piece of card across the area to dislodge it. Never try to squeeze a stinger out as this will result in injecting more venom into your pet causing them more pain. You need to scrape the stinger off in one single stroke in a diagonal direction. Apply ice wrapped in a tea towel to help soothe the area affected and take down some of the swelling. Because bee stings are acidic you can try the application of a mild alkali such as Bicarbonate of Soda – diluted and applied to the affected area. DO NOT give Piriton unless prescribed by your vet. Some dogs may have a reaction to the active ingredient contained in Piriton and could prove more dangerous to them than the reaction to a sting. Generally, bee stings should not be ignored and should be closely monitored. 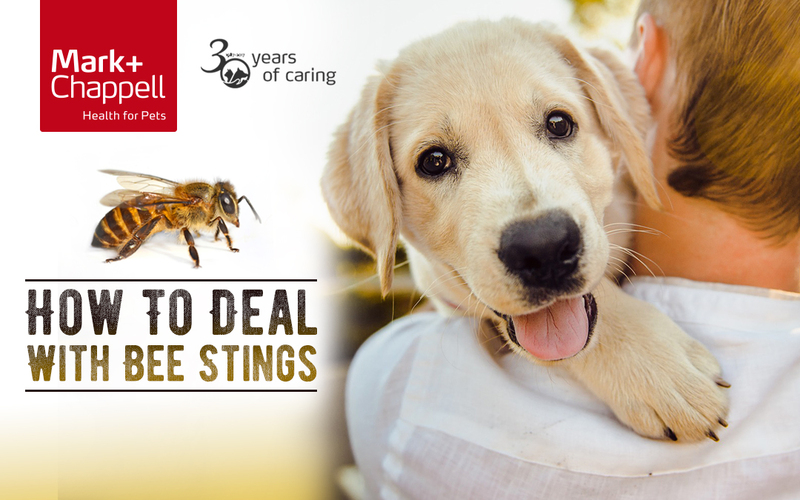 If you witness your dog being stung you may wish to take your dog to the vet anyway as a precautionary measure and most definitely if the dog has been stung in the mouth or around the head and neck.